1.Special engineered auto-feed feature.It will guide the material to cooling wheels automatically.The whole process from cooling to slicing is fully automted. No human interaction involved hence greatly reducing risk of hazard. 2.The surfaces of the cooling wheels are made of satainless steel.Material will be encountered with cooling wheels to provide twice the cooling effect. a. No electric heater is used on the machine.The old poor cutting problem caused by the insufficient electric heating temperature and the bad electricity conduct defect cause by the dust attached to the electeric heating structure shall never happen again. No deterioration of head point and the rear end of the working piece shall be affected by the electric heater temperature. b. Solve the problem of old electric heating cutter such as waste material, laber and time.while heating cutter cats on the material might cause burn mark on the front and rear portions. Due to problem, user needs to cut-off the burn mark manual. 4.The cutting length setting is done by the counter.High precision.Able to save the error material for each cutting. 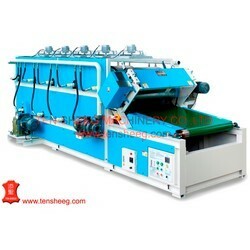 5.It does not need old type cotton conveying belt which may avoid the fall off of the threads after the conveying belt is used for long time and to stick on the materil to cause bubbled during forming further to upgrade the quality. 6.Every cooling wheel is equipped with a cleaning brush.It can provide continuous cleaning during operation.No contamination will be introduced to the processed materal. Cooling roller Width 38" / 50" 38" / 50" 38" / 50" 38" / 50" 38" / 50"